Lex is living a lie. He loves his son, Sam, and doesn't want to do anything to rock the boat. Lex is also hiding a truth that he believes will destroy his ranch and his life. When his son, Sam, asks if his best friend, Nick, can come for the summer to work, Lex doesn't hesitate to agree. Nick is used to being alone. He grew up in foster care and never had anything of his own, no real home to come home to. When he finds himself on Lazy River Ranch, he's excited, nervous, and incredibly attracted to his best friend's father. This story spans several years and we get to see glimpses on both sides of the timeline. I think that it was developed fairly organically, but it was still frustrating to see the before and only get hints of the in between. Lex has to find a good place because that's the only way he'll risk his son or Lazy River Ranch. However, he's somewhat lost without Nick. Nick is not necessarily lost, but he won't be allowed to love anyone else because he left his heart at Lazy River Ranch. Watching the two characters figure their stuff out, find that their attraction stays just as strong throughout the years is both sweet and predictable. Lex and Nick make a great couple and definitely have great chemistry. But it's the culmination of the story, involving all of the characters, that really makes it great. I do hope that Pete gets his own story too, as I think that he'll be a great addition. When I was a teenager I loved romance novels with Native Americans in them. This book had one and holy cow... I was thrown back to my youth and fell in love all over again!!! Nick is going to work on a buddy's family ranch. Lex is Nick's buddy's dad. Fireworks went off when they saw each other and they never stopped going off either! These two try and fight their feelings but they just can't. HOWEVER, Lex is so deep in the closet it isn't even funny. Nick decides he can't handle hiding and leaves before the summer is over. A random phone call several years later brings Nick and Lex back together and their chemistry hadn't cooled off at all. This story had me rooting for both Nick and Lex and for each of them to fight for what they wanted. My only regret was the book wasn't longer, I wasn't done with them, I wanted more, even though we did get a nice epilogue. This is a shortish book with a sweet story and a happy ending. I found the dialogue to be a little stilted in the beginning, but it seemed to smooth out along the way. I liked the premise, but did find the speed with which the two men fell for each other, and the resulting outcome to be quite extreme. Luckily fate, in the form of Lex’s son, Sam, manages to resolve the immediate problem of distance, and in turn of acceptance. The epilogue, set a good while later, is a fun way to round off the story. 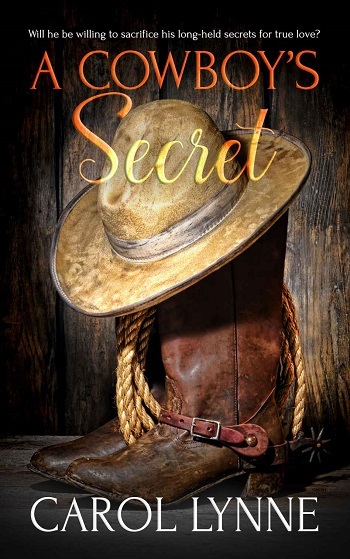 Reviewers on the Wicked Reads Review Team were provided a free copy of A Cowboy's Secret by Carol Lynne to read and review.